Just a few minutes from Naiharn beach, Villa Iwa is situated is a closed villa complex affording a luxurious and opulence experience to guests traveling to Phuket, Thailand. The 3-bedroom private oasis is home to abundant tropical and verdant gardens and a luxe Thai décor beautifying the entire property. The calm, tranquil and serene atmosphere of the area is just what you need as an escape from busy city lives. 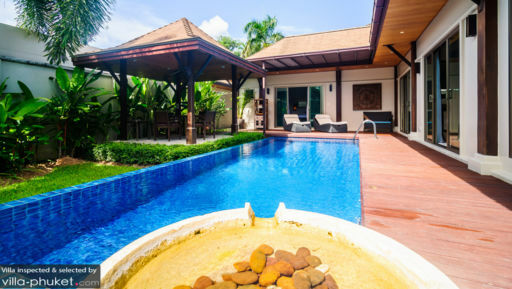 For a holiday, Villa Iwa is a gorgeous spot on the beautiful and majestic island of Phuket close to the Western shores! The master bedroom is furnished with a king-sized canopy bed for the utmost comfort and there is a study area for you to work at, if at all. A flat-screen TV ensures that you are entertained in case you wish to spend your time indoors. An en-suite bathroom completes the entire picture with an outdoorsy concept giving you an authentic tropical experience. There is a large soaking bathtub perfect for bubble baths and a personal spa! The two guest bedrooms at Villa Iwa are comfortably furnished with king-sized beds and en-suite bathrooms making for comfortable accommodation. The glistening cool and clear water of the swimming pool is surrounded by ample and dense greenery with well-manicured lawns to accentuate the natural and untamed beauty of Phuket. The swimming pool is fed a stone basin, a water feature that will put you in a calming and meditative state, perfect for relaxation and rejuvenation. 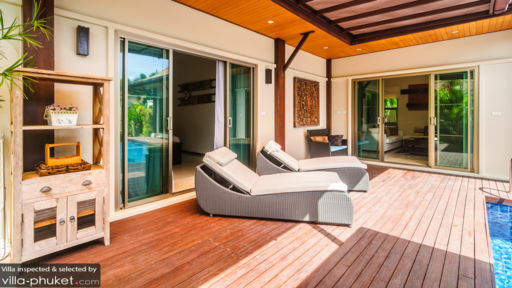 Beside the pool, you will also find a few sun loungers, for lounging on after a refreshing dip in the pool. There is a traditional sala outdoors complete with a large dining table for an authentic Thai dining experience with the cool breeze and fresh air engulfing you in its warmth. The living area is right off the swimming pool and is tastefully decorated with traditional Thai artwork and souvenirs highlighting the beauty of Thai hospitality. The plush couches and armchairs are placed pointed towards a flat-screen TV, for a relaxing day with your friends and family. There is a dining area with a smaller dining table in the middle and a fully-equipped modern kitchen with modern amenities present for the guests’ convenience. The cosy space is well-lit and has an abundant inflow of natural lighting through glass doors and windows. The room is air-conditioned to keep you cool for particularly hotter days. The room also affords a sense of luxury and ease due to its calming tones and neutral décor. Guests can spend their days on the cushioned sofas in a state of absolute bliss! There is a team of dedicated staff members to help you settle in and enjoy your holiday at Villa Iwa. There is daily house-keeping so you can relax without having to worry about a thing. There is a massage room at your disposal for in-house massages and spa treatments and security to ensure your safety. Naiharn beach and Rawai beach are a couple kilometres away from Villa Iwa, which are serene spots perfect for spending time during the days looking out to the sea. There are several great spots for dining out offering multiple cuisines, both local and international. Supermarkets, cafes, bars, and much more is available in the surrounding area of the villa and can be reached without a hassle.